General Jeff, head organizer of the proposed Skid Row Neighborhood Council, greets voters as they line up outside San Julian Park on Thursday, April 6, 2017. Keyama L. Bryant, a long-time resident of Skid Row, holds up her voter registration card for a special election held on Thursday, April 6, 2017. It came down to less than 100 votes. According to early results in a special election held Thursday, the effort to establish a neighborhood council representing Skid Row’s homeless residents has been defeated. If it had passed, the proposed council could have redrawn downtown L.A.'s existing neighborhood council borders, removing the city's most concentrated homeless population from the area represented by the Downtown Los Angeles Neighborhood Council and the Historic Cultural Neighborhood Council. In total, 764 people voted in favor of establishing the Skid Row Neighborhood Council while 826 voted against, winning the vote with a simple majority, according to the preliminary canvass of votes from Empower L.A., the city’s governing body for neighborhood councils. 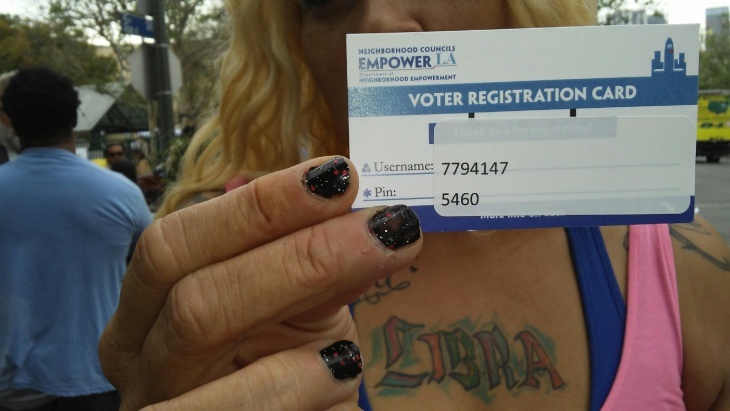 Official vote counts would be released in several days, subject to any challenges received by Empower L.A.
Last December, Skid Row residents submitted an application to Empower L.A., which the city then approved to go to an election. The move was seen by supporters as an opportunity to give the thousands of homeless residents living on Skid Row a stronger voice in their future. In the weeks before the election, Empower L.A. opened 12 early pop-up polling locations to anyone with a link to downtown – including thousands of residents, volunteers, workers and employers. Voting also took place online. After she voted Thursday afternoon, Sherry "Cocoa" Wright stood outside the James M. Wood community center, smiling. The day of the election was the most hope she felt for Skid Row since she moved there in the late 80's, Wright said. Sherry Wright, a long-time resident of Skid Row stands in line outside the James M. Wood Community Center on Thursday April 6, 2017. 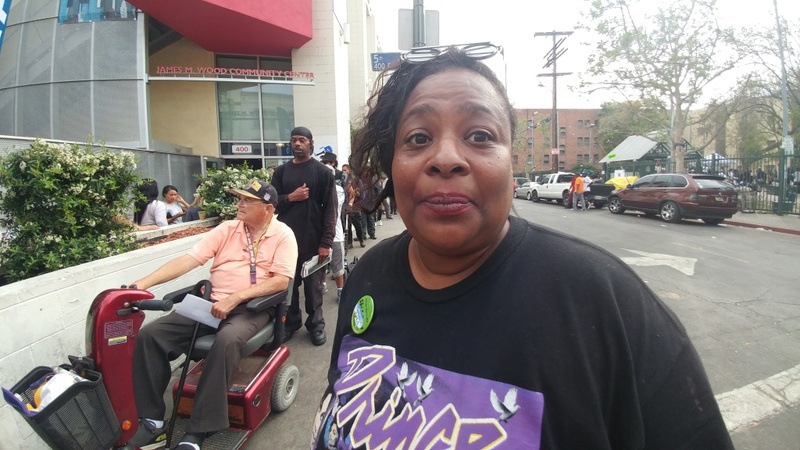 She said she voted for the Skid Row Neighborhood Council to push for construction of more affordable housing, youth development programs, public restrooms and showers for residents living on Skid Row. 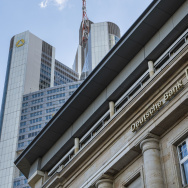 "I feel like we're on the verge of something big happening," Wright said. "We have so many issues, it could be a book." The vote came during a time of big support in L.A. for funding homelessness relief. In March, the city approved Measure H, a quarter-cent sales tax increase intended to raise more than $300 million a year for homelessness issues. Last November, voters passed Measure HHH, a $1.2 billion plan to construct more affordable housing. L.A.’s 96 existing neighborhood councils receive $37,000 each year in public funding, according to the Department of Neighborhood Empowerment’s website. Councils use the money to create events and programs that respond to community needs or advocate on behalf of the issues they care about. 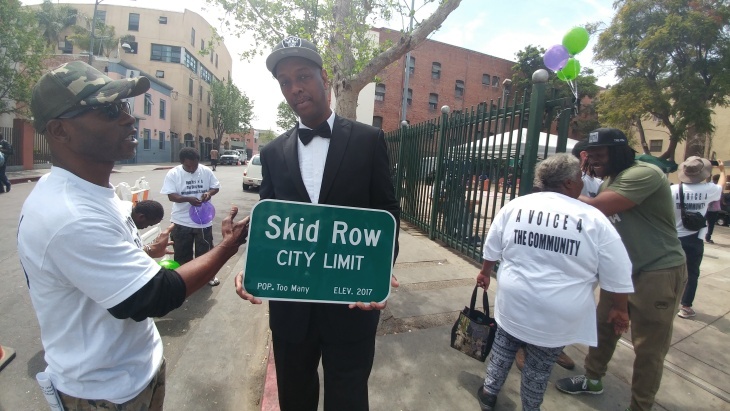 But, for now, Skid Row will remain a part of downtown. General Jeff, a head organizer of the proposed Skid Row council, delivered news of his campaign’s defeat to a crowd of supporters in San Julian Park, where earlier on Thursday volunteers grilled hot dogs, blew up balloons and danced to live hip-hop at a community pep rally. After losing the election, General Jeff said he and community organizers would meet Friday night to debrief and explore “any and all options,” including legal options, to challenge the election's outcome. 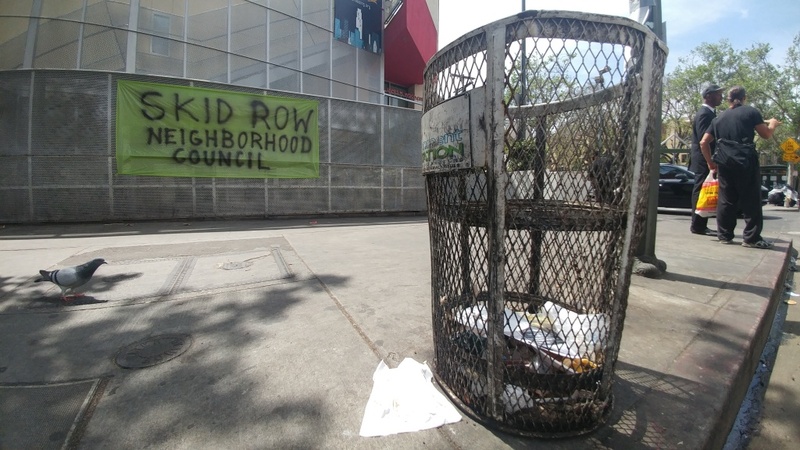 Opposition to the council came from outside of Skid Row, from members of downtown's existing neighborhood councils as well as residents in housing developments nearby. Eduardo Alvarado, a board member on the Downtown Los Angeles Neighborhood council told KPCC he was opposed to the split. As an advocate for the area's homeless residents, he said Skid Row breaking away from downtown's council would be a bad decision, because a channel to voice concerns about homelessness issues already existed on his council. Alvarado said he would encourage more people living on Skid Row to "show up" to downtown's council meetings and voice their concerns on housing and public restrooms, something skid row council advocates say they've already tried. In an interview, Alvarado compared the downtown council to a picnic. "One person can bring the bread. One person can bring the peanut butter. One person can bring the Kool-Aid, and we can all eat,” he said. 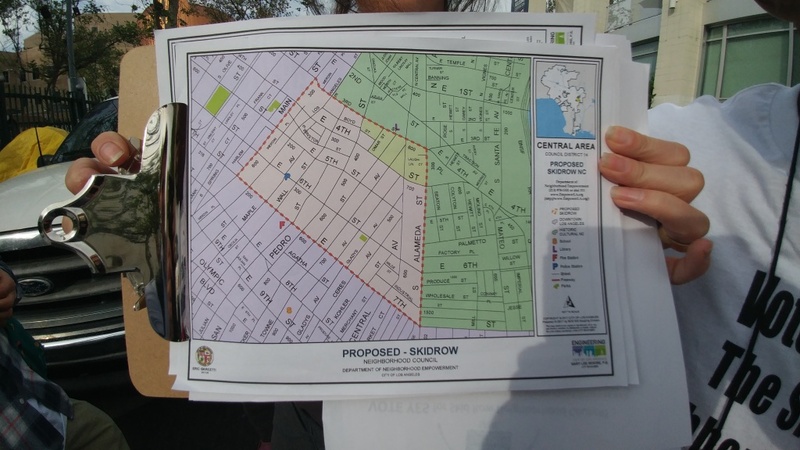 A volunteer holds a map showing the proposed borders for the Skid Row Neighborhood Council on Thursday, April 6, 2017. The effort to establish the council was defeated in a special election, to the disappointment of hundreds of homeless Skid Row residents. 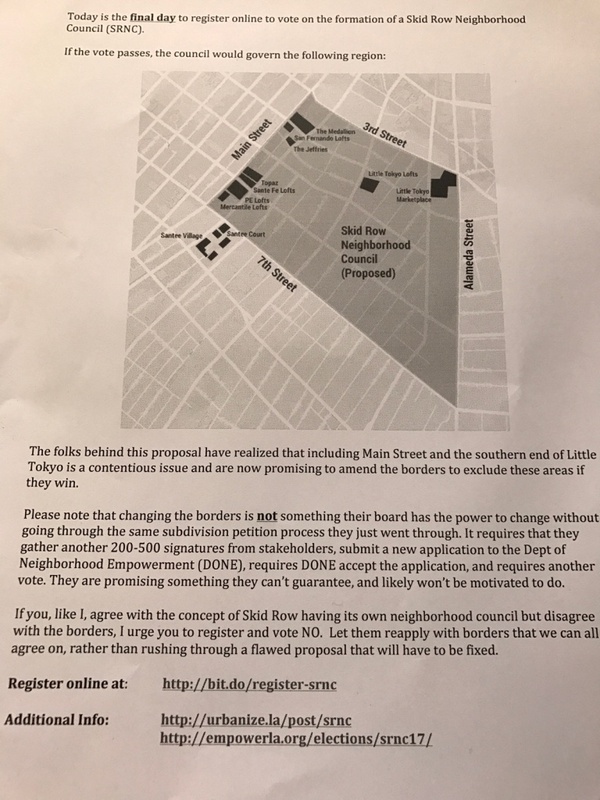 Opponents also delivered anonymous fliers to nearby residents this week, claiming the proposed Skid Row Neighborhood Council's borders unfairly included residents of Little Tokyo and developments along Main Street. An anonymous flier sent to residents living in the borders of the proposed Skid Row Neighborhood Council. The flier urges voters to vote against the measure, claiming the council's borders are contentious. "The folks behind this proposal have realized that including Main Street and the southern end of Little Tokyo is a contentious issue and are now promising to amend the borders to exclude these areas if they win..."
"...If you, like I, agree with the concept of Skid Row having its own neighborhood council but disagree with the borders, I urge you to register and vote NO." In its history, the Downtown L.A. Neighborhood Council has supported job fairs on Skid Row, the city's annual homeless counts and other measures related to homelessness, Nate Johnson, an attorney and board member on the council, told KPCC. While the Downtown L.A. Neighborhood Council didn't issue a public stance on the Skid Row council election, many of its board members voted against it, Johnson said. "It differs from person to person," he said. "I think [the election] served as an opportunity, a wake up call to us [on the council]." Much of downtown's existing neighborhood council's focus is on supporting the neighborhood's rapid development projects, something the proposed Skid Row Neighborhood Council was likely to resist, he said. 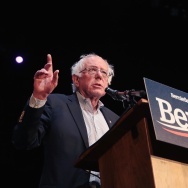 At Thursday's election, Johnson voted in favor of the Skid Row Neighborhood Council. He said he hadn't seen his council take many official stances on homelessness, and felt board members at the Downtown L.A. Neighborhood Council could do more to include Skid Row's residents. "I understand the concern that the Skid Row Neighborhood Council could threaten to divide L.A.," he said. "But if people who live on Skid Row feel that [the Downtown L.A. Neighborhood Council] isn't representing them, who are we to tell them otherwise?" Off-Ramp Recommends: For Easter, get off your keister!